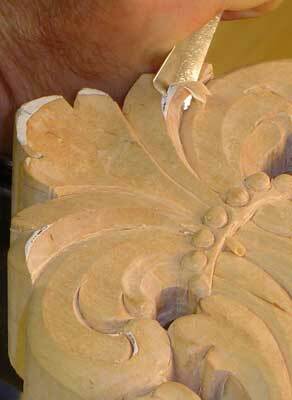 The clock in this article is a traditional design taken from the Norwegian master carver Johan Amrud 1913-1997. 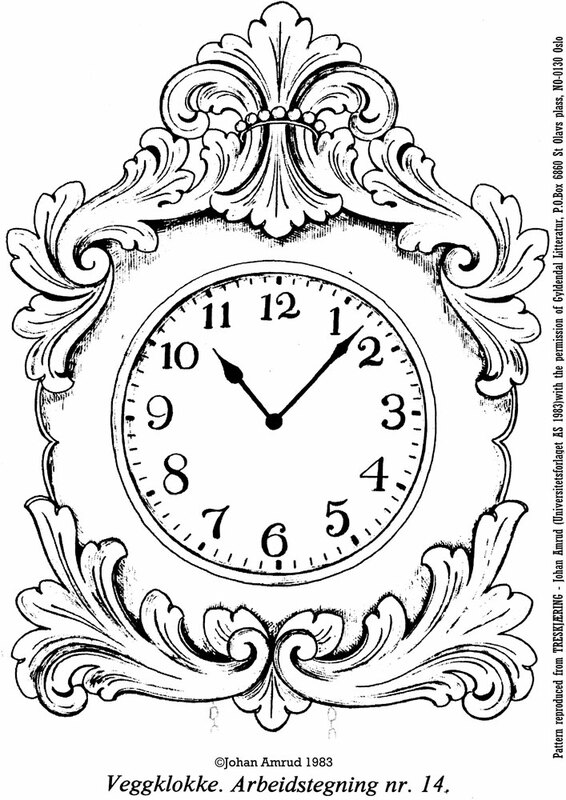 You may have to adjust the pattern to suit your clock mechanism - in my case a 160mm (6 1/4in) diameter face - so that the face will fit within the carved bevelled ring. As my timber was not thick enough, I have used the off-cuts from the birch slab glued to the back to increase the thickness of the piece and to bulk up the side profile. 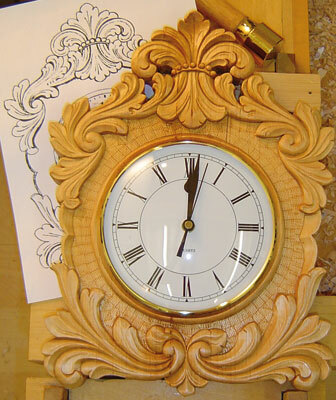 The enlarged pattern was stuck to the blank, using spray mount, and then the hole for the clock mechanism was cut with a hole saw, prior to roughing out the pattern with a thin blade in a bandsaw - although a coping saw can also be used. 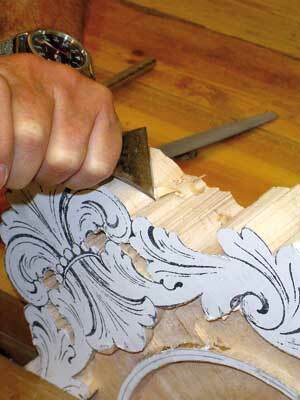 Just remember to make 'relief' cuts at suitable points round the pattern to allow the waste to drop away without jamming the saw blade. 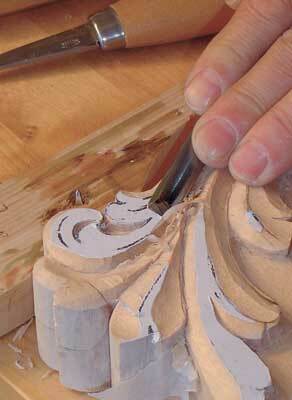 In this case, I have undertaken what could be called an 'initial finish' on the sawn edges, as the pattern will be carved over and round the edges - a near final edge is needed. 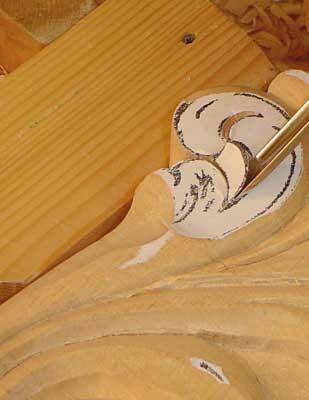 The edge preparation should be undertaken with a straight chisel to remove the worst of the saw marks, and then with a set of files or tungsten carbide coated tools - as the work is yet to be carved, do not use conventional sheet abrasives for this, as they will leave an abrasive residue that will dull the edges of your tools. Select the curved gouge that best suits the arc of the pattern, and set-in all the lines round the pattern and both sides of the circular bezel. 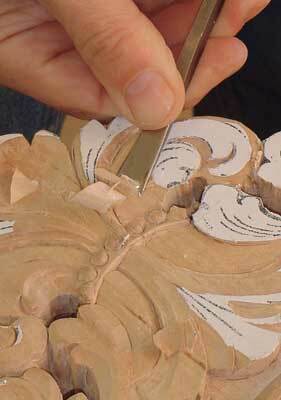 The easiest way to then 'ground' the carving is with a powered router, to take out the bulk of the waste round the clock face. If such a tool is not available, then mark a drill bit with the necessary depth stop and drill multiple holes and carefully cut out the waste with a chisel. 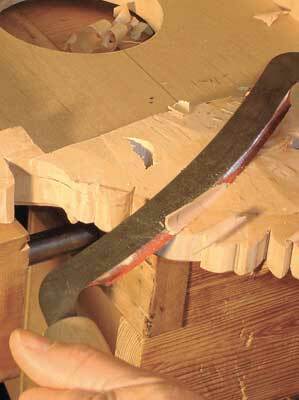 In either case, the subsequent lowered base can be tidied up with a chisel or an 'old hag's tooth' router (see photo 2) such as the Stanley No.271, or easily made from a suitable block of hardwood and a Stanley blade. At long last the carving can commence. 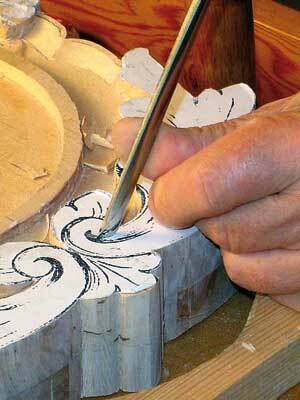 Start at the middle top or bottom and carve out towards the edge. To minimise the chance of an unfortunate slip, take a V-tool and quickly outline the main dividing lines between the leaves. 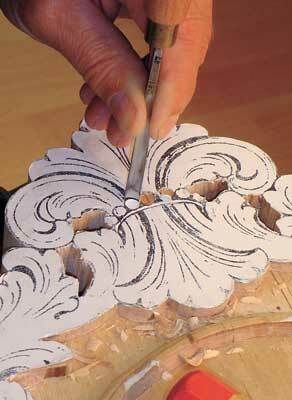 I would recommend that you carve symmetrically - that is, carve a bit on one side, then immediately carve the same bit on the other. 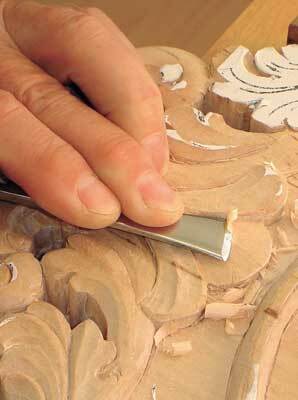 That way you will be using the same tools more efficiently and reduce the challenges of remembering which way to carve with the grain. 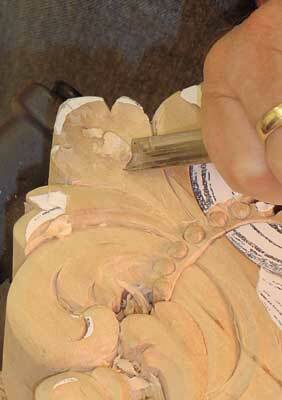 With the acanthus, the technique is to match the sweep of your gouge to the curl that you want to carve, in this case a No.7, starting at the tightest 'ball' end, then change gouge to your next wider sweep progressively until you reach your No.3 at the leaf tip. 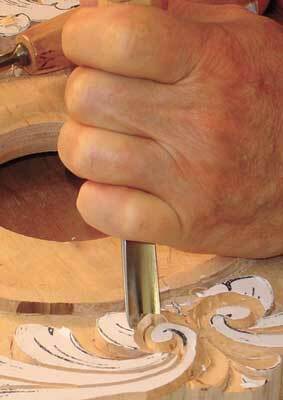 The first cut is a vertical stab cut, rotating the gouge to get a clean cut in towards the start of the ball then in the reverse direction, to run round the whole circle of the gouge to set in the rest of the base of the ball end (see photo 5). 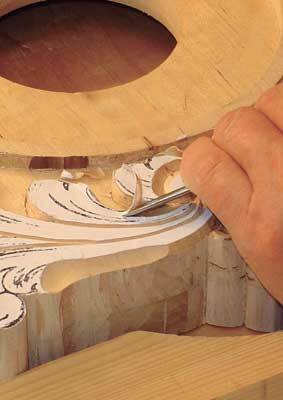 This is followed with angled slicing cuts, taking care to rotate the cut with the grain, to clear around the ball end (see photo 6). The same process is repeated with the next lower numbered gouge and the next, to follow the unfurling line of the pattern out to its end. 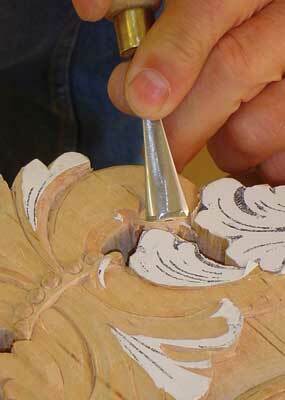 With the base of the leaf now defined, turn the gouge over so that you are cutting with the inside edge and work the outside leaf edge, rounding-off the ball and then the leaf itself. 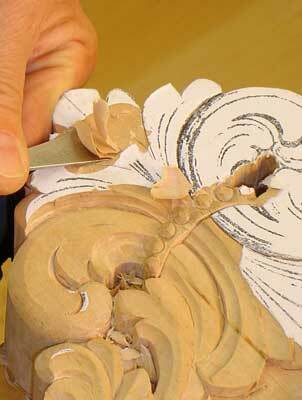 With the convex outline of the leaves now established, the upper concave shapes can be started. Make sure that your No.5 is really sharp, check the grain direction and make a bold smooth curve along the top of the leaf (see photo 7). You can then turn the gouge over and come back along the outer convex side with, ideally, the two cuts meeting along the ridge line (see photo 8). Clear the waste and clearly re-delineate the base of the valley with a slicing cut along the join with the adjacent leaf (see photo 9), before repeating the process again - No.5 or No.7 for the concave top and then the No.5 reversed for convex side. 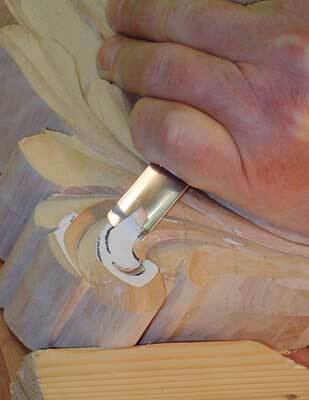 Towards the base of the leaf curl, where the whole stem is convex, the inside shape will need to be developed through a whole series of fine cuts with a straight blade - if you have a bent back chisel this will be easier (see photo 10). 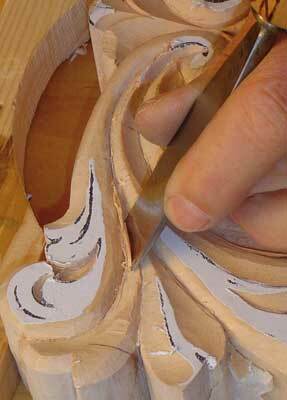 The final curved shape needs to be developed by moving from one side of the stem to the other with the front or the back of the gouge as appropriate, together with slicing cuts along the valley between leaves to clear the waste and to develop the depth of the carving. This whole sequence is repeated, leaf-by-leaf, for the rest of the pattern on both sides. 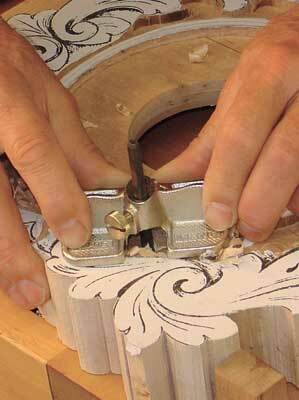 When you get out towards the bottom corners, you will have to set-in the final curl with a No.7 and clear the waste with a rotating cut (see photo 11), so you can confidently round over the end to finish the large terminal curl with a flourish, not forgetting the No.7 for the concave top (see photo 12). 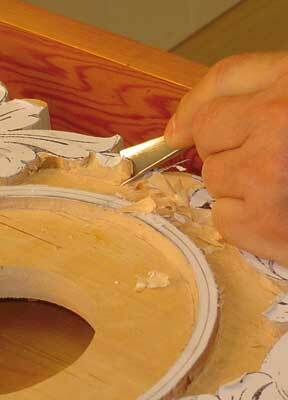 To start the top of the pattern, first outline the small bobbles on the crown by rotating a small No.8 or similar in an exact circle (see photo 13). Having established these circles, set-in the curve far enough away from them to ensure that your timber can take the necessary fine detail - I left it a bit tight and gave myself a lot of grief having to very carefully develop the bobbles, through cautiously removing small chips above and below the bobble to avoid splintering the remaining band. 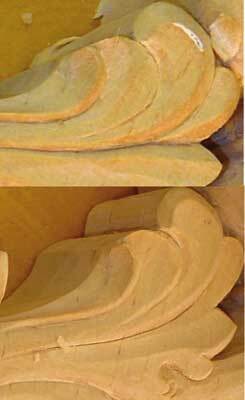 You can then move onto establishing the outline of the plume, with the curl of the top feather being achieved by fairly coarse removal of waste with a No.5 successively cross-grain (see photo 14) then with the grain from both directions (see photo 15), carefully clearing down to the stop cuts at the crown ring with a No.7 (see photo 16). The bottom edge of the crown plume is developed in the same way as a leaf end, with its outside edge over the top of the first large leaf, starting with a bold sweep of a No.7 to make a convex outer edge, followed by a No.5, and then finally running the central plume downwards with a reversed No.3 (see photo 17). You are now ready to start the large leaves. 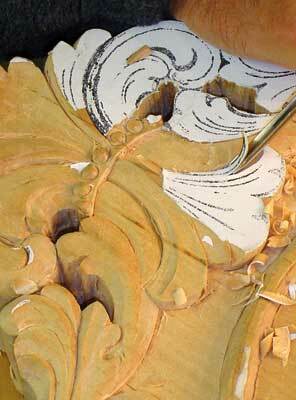 The first large leaf curls either side of the central plume have to start well below the plume, having to be heavily cut back so that they reach up from the lower level of the clock face, going underneath the crown ring to end up at the highest level on the edge of the carving. 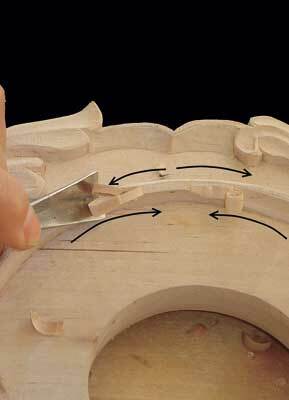 This necessitates the bold removal of waste (see photo 18), initially across the grain with a straight chisel and then, when the correct levels have been established, returning with the No.3 reversed and No.5 (see photos 19-20) to establish the convex curves of the sides, and finally carefully running a No.5 along the tops to give the otherwise convex shape with a subtle concave finish (see photo 21). The top supporting plumes, while developed in the same way as a leaf, need to be finished with a single run of a No.5 on their inside edges, leaving a smooth concave curve along their length. 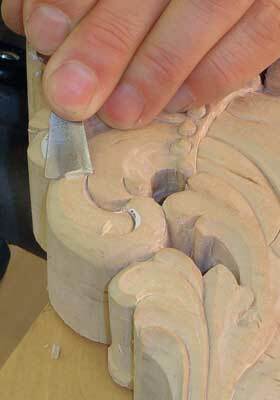 From here, move systematically outwards to carve the supporting leaves before finally, when there is no further danger of accidental damage, returning with a small skew to carefully clean up the crown ring. 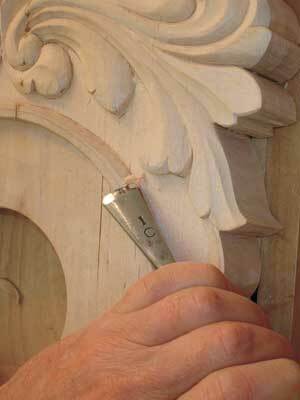 The central bezel is shaped with a No.5 to make a convex moulding on the outside (see photo 25) and a concave moulding on the inside. Remember that the outside is worked systematically, taking into account the changing grain, as illustrated in photo 25. 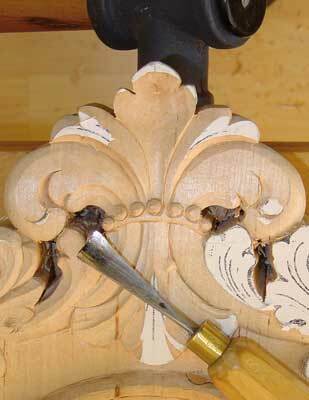 Now put the carving end-on in a vice and shape the back of it with a straight-edged tool to give it a subtle curve that lightens the profile and accentuates the crowning plume (see photo 27). Although clocks are designed to be viewed from the front, I also go round the edge with appropriate gouges to round the pattern from the back to front - that way it will retain more character when viewed at an angle. At this stage, provide some form of hanging mechanism. I have seen all sorts, from a simply carved slot, through a strategically placed fence staple, to conventional picture hangers - the choice is yours. Finally, carefully re-draw the leaf veins from the pattern and follow them round with a V-tool, before using some form of pattern punch to mark the clock background. 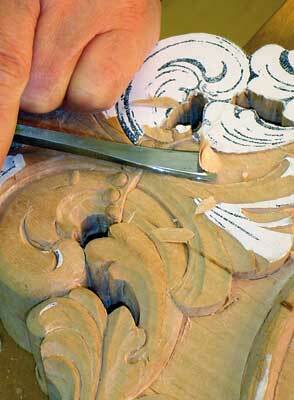 Dust the carving off, apply your favourite finish, fit the clock mechanism, and stand back to admire your work. 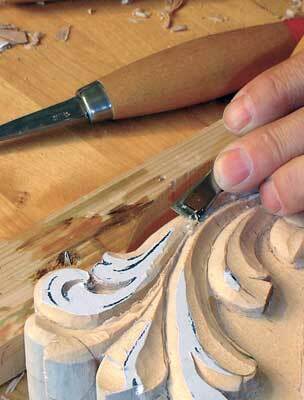 "With the acanthus, the technique is to match the sweep of your gouge to the curl that you want to carve"